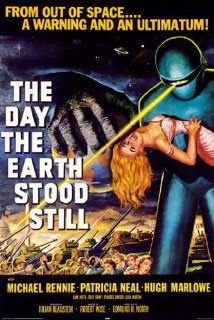 Based on the short story Farewell to the Master, The Day the Earth Stood still is a 1951 anti-war film directed by Robert Wise. The film opens with a flying saucer landing at a baseball park in Washington DC. After landing a humanoid exits the craft and announces he has come in peace. The humanoid begins to approach a crowd that has formed and opens a small tube but before he can finish opening the tube he is quickly gunned down by an antsy soldier. Gort, a large robotic like being comes out of the saucer and begins to shoot ray beams from his face mask at all the soldiers weapons. In a matter of moments having neutralized all the weapons Gort is ordered to stop shooting by the humanoid. They came in peace, bearing gifts and we shot them. The film clearly has an agenda and unlike Invasion of the Body Snatchers there is nothing subtle about its approach. The message is clearly laid out by our visitor and in turn the film wears its heart on its pacifist leaning sleeve. With lines like: “no war? That’s a good idea”, you would be hard pressed to miss the point of this film. While the film isn’t subtle it’s also not preachy. I never found myself thinking “alright I get it” and that is a difficult balance to strike. I've been going back and watching science fiction and horror films from the 50s and 60s lately and one thing has become abundantly clear, a great number of film makers who worked in genre pictures made intelligent films for adults that had scares and action but they also had heart and mind, something that is sadly missing from most modern horror and scifi. The Day the Earth Stood Still earns its status as a classic rightfully. The film has a message but it goes down smooth and that message is timeless, something worth repeating. Sadly, the remake of this film seemed to completely miss the point. Don’t bother watching it, please just go back and watch the original. I can see the remake was made with a competent cast and crew but they just didn’t crack the script, it felt flat and lifeless. Sure it had pretty special effects and plenty of loud noises but it was boring. The remake is great example of sound and fury signifying nothing. Thank you Billy Shakes. When I was watching this a friend came in and asked me if I was watching Leave it to Beaver. Yes this is a 60 year old black and white film that has been remade into a forgettable film starring Neo but if you are struggling to find something to watch on Netflix and you're thinking about re watching that last season of Supernatural give this one a shot. You won’t regret it.